﻿ What to do in Barcelona on New Year’s Eve? What to do in Barcelona on New Year’s Eve? 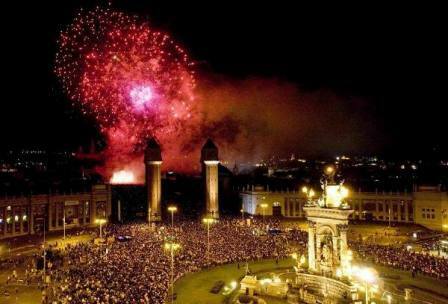 Barcelona, the ultimate party city, certainly leaves no stone unturned when it comes to New Year’s Eve. There are plenty of options to choose from if you want to enjoy the last day of the year in style. Whether you celebrate in the streets, at a party, in a beach club, or at a gala dinner, Barcelona is a fantastic place to start your new year with a bang! Here are Pub Crawl Barcelona’s picks for New Year’s Eve in Barcelona. Global clubbing giant Pacha welcomes Swiss superstar DJ Luciano into the fold for an epic NYE’s rave up! Since Luciano has always been at the forefront of techno and house, get ready for some explosive sounds. Tickets are available from €60 (includes free drink), but hurry as they go up nearer the date! Dinner packets start from €150. Shôko is one of the coolest restaurant clubs in Barcelona offering an Asian–Mediterranean fusion cuisine and lounge club with an amazing beachfront terrace. They give you the opportunity to celebrate New Year’s Eve four times throughout the night as the theme changes from the happiness of Seville and the colorful Mexico, to the modern New York and Rio’s seduction. Tickets are available from €50 but you have to pay much more for an ultimate gastronomic experience. The Gala dinner is accompanied by performances from the best artists, from dancers to musicians. This authentic Irish Pub is located in the centre of the city. With the cheapest Guinness and gin and tonics in Barcelona, buckets of beer (five bottles) for just €10 and the chance to do battle with their one metre beer tower, those without a plan yet for New Year’s Eve could do a lot worse than joining in the party at Shenanigans! Great fun on any night of the week, the last day of this year promises to be something special… Find the place just off Las Ramblas.